Pilgrims from across North America gathered at Saint Tikhon’s Monastery, South Canaan, PA May 28-29, 2000 to celebrate the glorification of the first Orthodox Christian bishop to have been consecrated on North American soil—Saint Raphael Hawaweeny. Today—February 27, 2015—marks the 100th Anniversary of Saint Raphael’s repose. 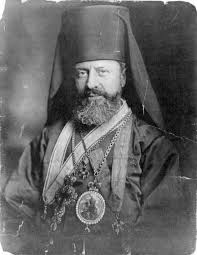 His many missionary and pastoral journeys across North America to gather Orthodox Christian faithful of Middle Eastern background had taken their toll. He fell ill early in 1915, patiently bearing his infirmities at home. At 12:40 a.m. on February 27, he fell asleep in the Lord. From his youth, Saint Raphael’s greatest joy was serving the Church. When he came to America, he found his scattered flock and called them to unity. He never neglected them, but traveled throughout America, Canada, and Mexico in search of them so that he might care for them. He kept them from straying from the faith and protected them from spiritual harm. During 20 years of faithful ministry, he nurtured them and helped them to grow. At the time of his death, the Syro-Arab Mission had 30 parishes with 25,000 faithful. Saint Raphael also was a scholar and the author of several books. He wrote many, if not most, of the articles that appeared in The Word magazine—still published by the Antiochian Orthodox Christian Archdiocese of North America. While serving his own Arabic community, he reached out to Greeks and Russians, speaking to them in their own language. He became fluent in English, and encouraged its use in Church services and educational programs. Saint Raphael came into contact with all sorts of people, and was a gentle father to them. He gained their love and respect by first loving them, and also through his charming personality and excellent character. He was always kind, merciful, and condescending with others, but was strict with himself. Having accomplished many good things during his earthly life, he entered the joy of eternal life where, with the holy angels and saints who went before him, he offers ceaseless prayer and praise to God. A detailed account of Saint Raphael’s life and labors may be accessed here. Through the prayers of our father among the saints, the holy Bishop Raphael, may we also be made worthy of the heavenly Kingdom.